So bright and fresh! Almost immediately the amount of time we had the light on was cut drastically. With only a small window of its own this room has always relied on borrowed light from the kitchen but more often we would have the light on during the day. 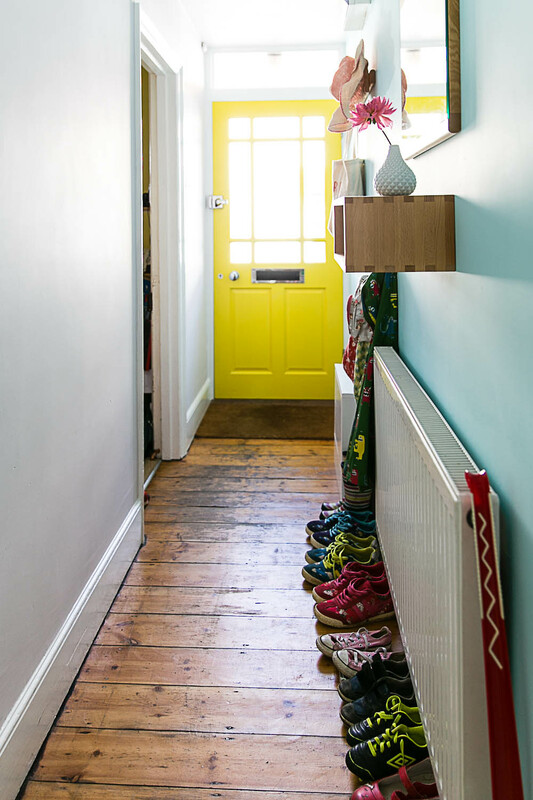 The white floorboards live up to our hopes of increasing the brightness in the space. 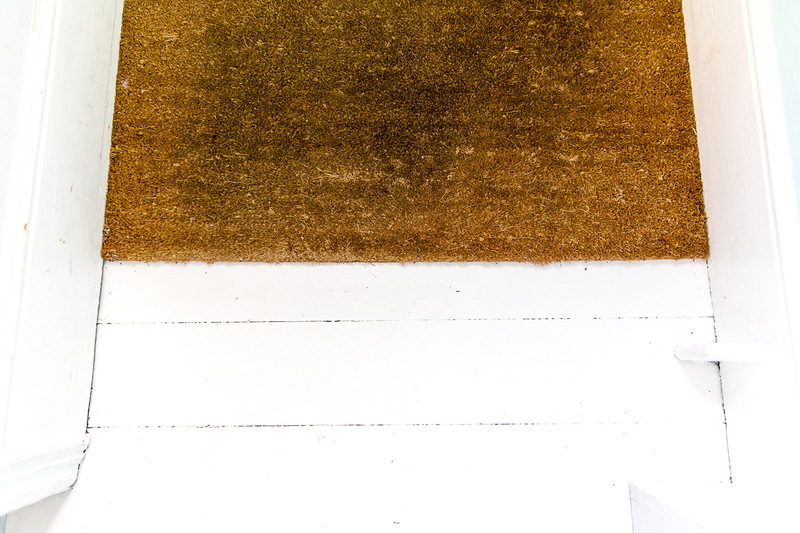 Sadly our gorgeous berber rug suddenly looked dirty against the pure white floor. 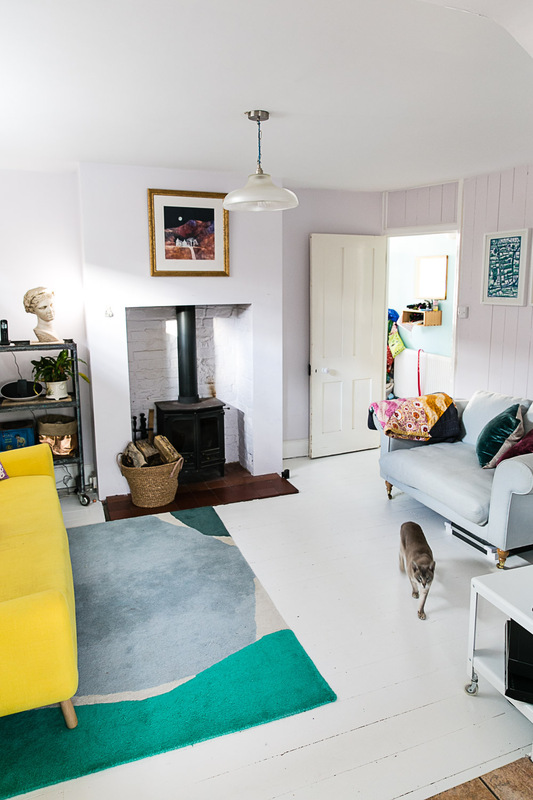 We lived with it for a while but it didn’t do any justice to the rug so we switched it out for this Matisse inspired rug which really pops against the white floorboards. The corners of this room have always been a little dingy but they are now open and bright. I have begun to hang my collection of plates in the corner by the cupboard which is also benefitting from switching out our old black TV stand for this white metal coffee table. In practical terms painting the floor after having it varnished needs some prep. This paint can be painted directly onto varnish or onto prepared wood but as our floor was worn back to the boards in some places and still shiny in others our decorator keyed it all back to ensure an even finish. Jake is very particular about his materials (if you’re in Winchester and need a great painter drop me a line, he’s the best) and he was pleased with the quality and finish of the V33 Renovation Paint. The recoat time is 3 hours so he was able to apply a second and third coat relatively quickly. For context – we left the house on a Wednesday morning and it was finished by Thursday night including sanding time. The big question is how do white floors and a family of five mix? One of the reasons I always leave a few months before posting about products which are so permanent is I want to truly test out how well they wear. I know you wouldn’t appreciate me evangelising something which six month later needed further work. The finish was slippery at first and I was concerned that we might always have to wear slippers but after a month or two this stopped being an issue. If you have very young children / babies you might want to hold off on painted floors for a little while. 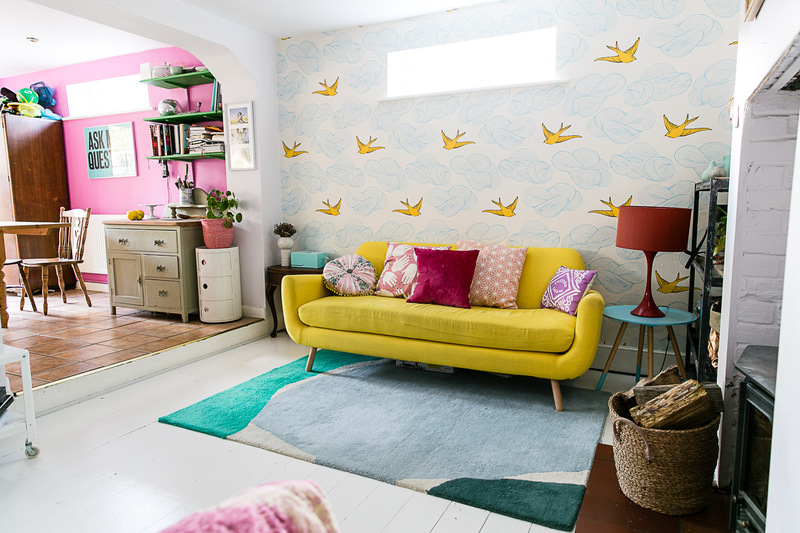 These floors have taken through Spring, Summer and into Autumn. They are pounded daily by our children and frequently covered in muddy footprints on a rainy day. We mop the floors twice a week but otherwise don’t give them any special treatment. I am impressed with how nice they look this many months on. The paint has not chipped or scuffed and when it’s clean it looks as good as it did on that first day. 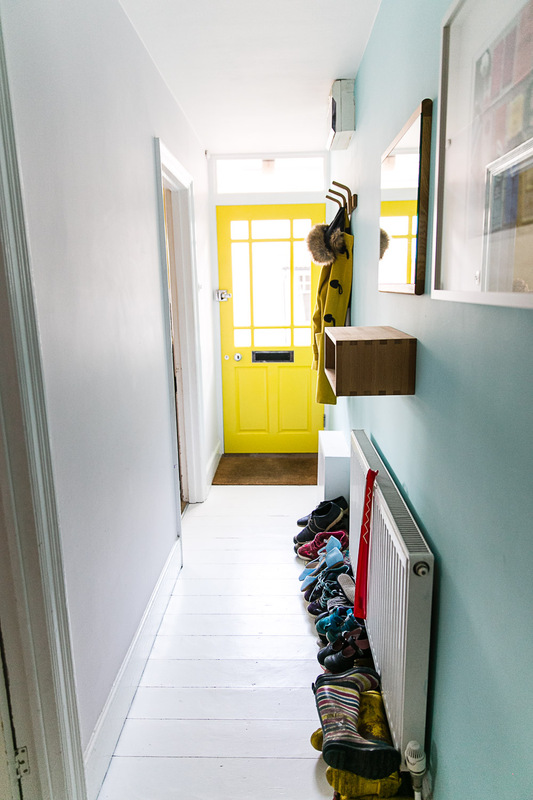 I’ve photographed the two highest traffic spots – the bottom of the kitchen step and the front door – so you can see for yourself what it looks like. I am so happy we decided to do this, it makes the world of difference to the mood in the house. 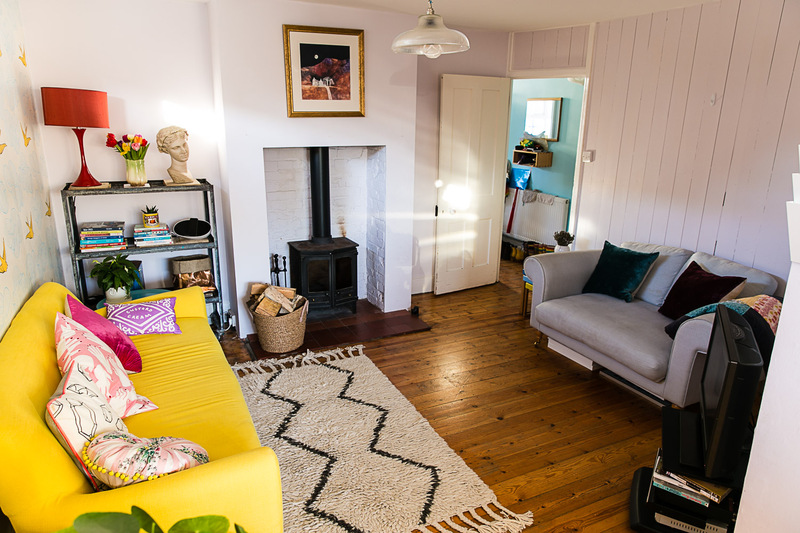 White floorboards have rounded off the fresh and happy look we have tried to create in our space and created so much light. We used: V33 Renovation Paint from B&Q, specifically the V33 Renovation White Satin Wooden Floor & Stairs Paint. 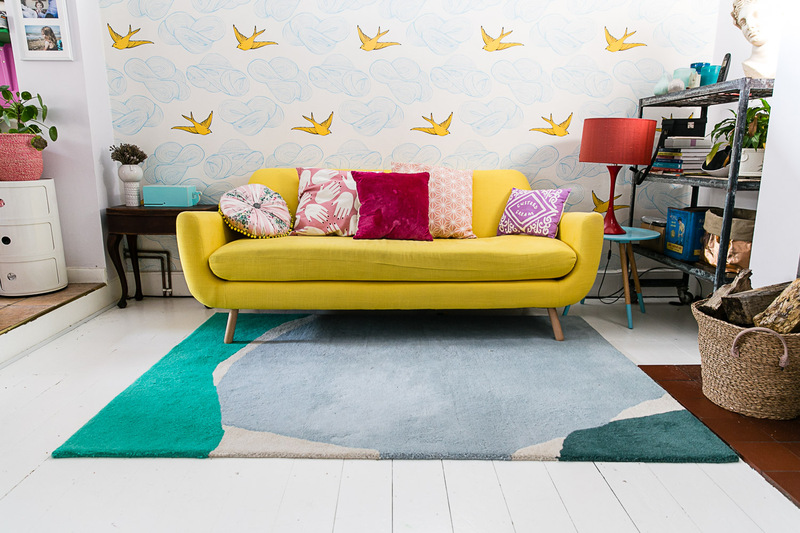 The Rug and plant holder are both last season from Oliver Bonas. Tv stand is the IKEA PS 2012 Coffee Table. All other items can be found in my last decoration post. This project is a supported by B&Q who provided the paint & materials we used for the makeover. Labour, additional materials and furnishing model’s own. KAT! This is FANTASTIC. White floorboards are my dream home THING. 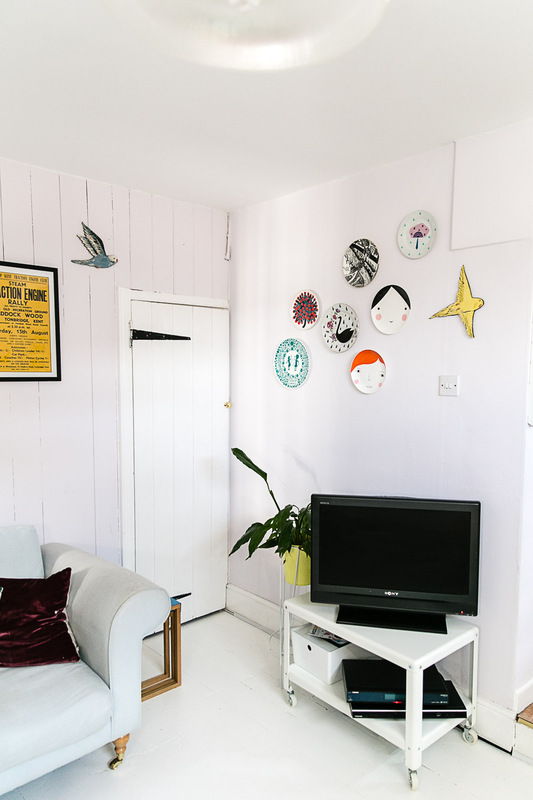 We had fake white flooring in two bedrooms in an old flat (the one we did the blogtacular vid in all those years ago) but one day I would love real wooden painted white floorboards like this. FAB. 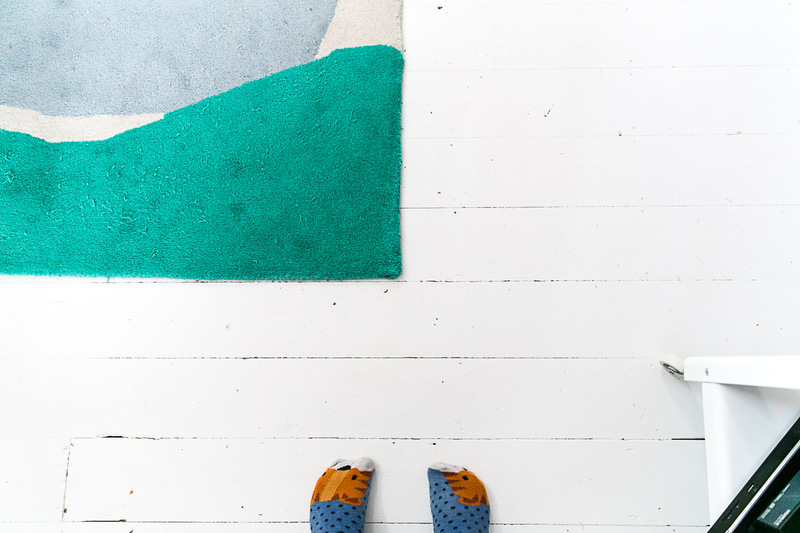 White floorboards – now, in your world of colour, this is definitely something I can get on board with. Wow that screams happy and joyful doesn’t it. What a difference white can make. Love it. Should I paint the inside of my beach hut white now?! Look what you’ve done!!! I love it!! It looks really great. I hate being limited by what we are allowed to do in our rental. HA ha ha! Not completely easy to keep clean (wet weather is the worst) but worth it because they look so nice.